Samuel Griffin and Rebecca Smith. 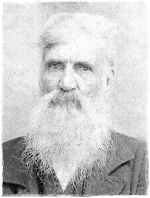 Bondsman was Isaac Smith. Witness was Thomas Ragland. Edith (Griffin) Pearce was not the daughter of John Griffin. It is easy to assume that from the Census of 1870. However, if one digs deeper, it becomes clear that John Griffin was probably never married. Edith was in fact the daughter of Samuel Griffin and his wife, nee Rebecca Smith, of Chatham county. Apparently John Griffin was Samuel's brother. Samuel and Rebecca had other children (Samuel, Rebecca, Ruth, Luzenia, at least), and you can find some of them residing in the household next to Thomas M. Pearce in the 1870 Census...According to her tombstone in Old Mount Olivet Cemetery, near Erect, Randolph county, North Carolina, Edith died in 1889. That date came from a memo in the Bible of the Kinney family, of Franklinville. Mrs. Kinney was a daughter of Camilla Janette "Nettie" Pearce Allred, daughter of Mary A. R. Pearce and granddaughter of Thomas and Edith.